This page is the index to our series of lesson plans that follow the Kings of Israel. This page will be updated as the posts are published. These lessons were designed for older elementary children, but you could modify them for a broader range of kids. Like all our content, this curriculum is 100% free to use in your church, home, or school. Click here if you would like to share how you are using them. Other Resources: There are many excellent places on the Internet to find children’s Sunday School lessons. Here are a few that might help you further develop what we’ve posted above. You are encouraged to collect ideas from several places and craft a lesson that best suits the children you teach. Browse our Sunday School Coloring pages if using theses lessons with younger kids. These are the best lessons for teaching the church sundayschool. excellent page. full of worth. 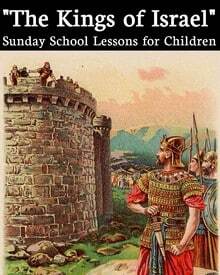 very helpful for my ministry, started the topic kings of Israel from yesterday.These are the best lessons for teaching the church sundayschool. I am always looking for good Sunday School material that actually uses the Bible. These are wonderful lessons that I am going to adapt to our youth ministry. Thank you so much for continuing to publish great lesson material. I have been using Ministry-to-Children for at least 15 years for various ages. Y’all continue to aid in my ministry and I thank you for that!